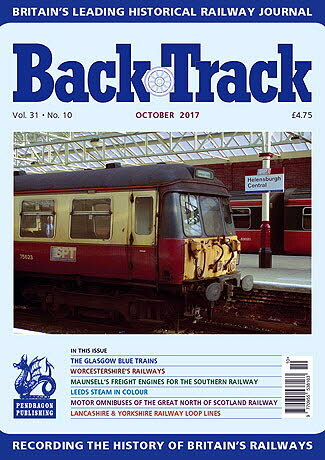 Railway Magazine | BackTrack October 2017 journal from Pendragon Publishing. The Motor Omnibuses of the Great North of Scotland Railway and the General Post Office - John Roake discusses local mail delivery arrangements with railway help. Eric Bruton on the Great Northern Suburban Trains - archive photos from the 1940s/50s. Lancashire & Yorkshire Railway loop Lines - developments in North Lancashire, Manchester, Bury and Liverpool described by Jeffrey Wells. Ryecroft Reminiscences - David J. Hayes concludes his account of this West Midlands scene near Walsall in the 1970s. Look at Leeds - three colour pages of steam by Gavin Morrison. The Railway in Court: Doors Closing - some legal cases examined by Bill Taylor. Worcestershire Railways - a survey of the county by Steve Roberts. The Curious Incident of the Manning Wardle Class N - Robert Emblin looks into an industrial locomotive mystery. The Glasgow Blue trains - A personal reminiscence of over 40 years of observations by Allan Trotter. 'Rather Unprincipled Persons': Ministers of Transport - the First Ten Years 1919-60: Part Two - A. J. Mullay concludes his review of their varied contributions to the course of railway history.